Ideal all-year-round garden piece that instantly adds height to any garden size or style. Named after the highest mountain in Wales, the obelisk stands at 2m high and its pyramid shape suits a variety of climbing plants. It fits securely into the ground, and would make a attractive addition placed on a rockery or flowerbed. Made from FSC Certified pressure treated timber, it is strong and durable and can be reused for years to come. 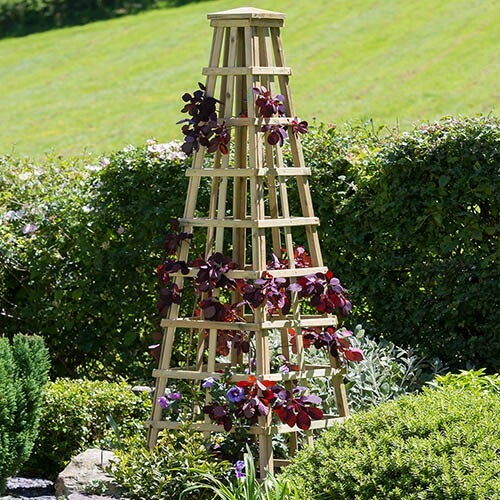 The Snowdon Obelisk is a great all-year-round product that automatically adds height to any garden size or style. Named after the highest mountain in Wales, the obelisk's pyramid shape suits a variety of climbing plants and fits securely into the ground, or placed on a rockery or flowerbed. The Snowdon Obelisk is manufactured from high quality, pressure treated, FSC® Certified timber to last longer, so you can be sure that this product will last the test of time and remain a beautiful feature in your garden. Dimensions: 0.60m x 0.60m x 2.00m, assembly required - This product is 1-person assembly.